I know Thanksgiving isn’t even here yet, but I wanted you to have this recipe now for those turkey leftovers, so you will have time to pick up wild rice and anything else you might need before the big day! Tired of the same old turkey leftovers and need a change? 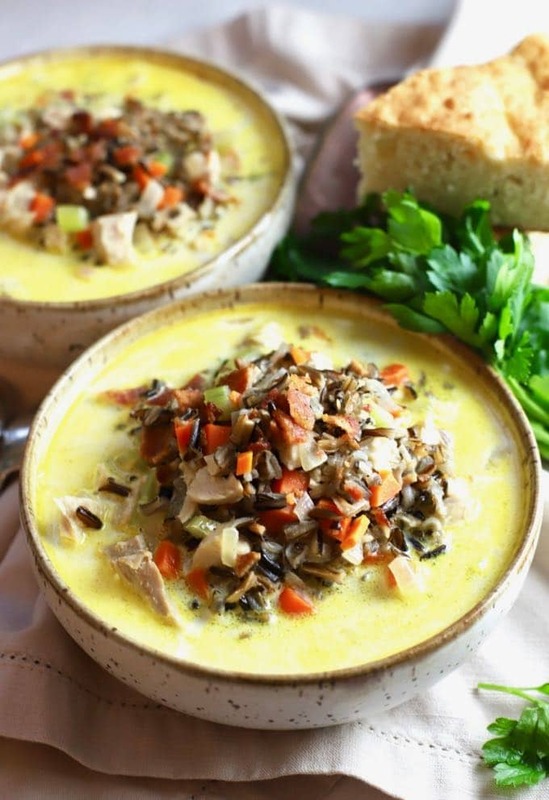 I have just the thing for you, Creamy Leftover Turkey and Wild Rice Soup! It’s a great way to transform leftover Thanksgiving turkey into a hearty and satisfying meal. After all of the decadence of Thanksgiving, this easy turkey soup recipe is a great change of pace. 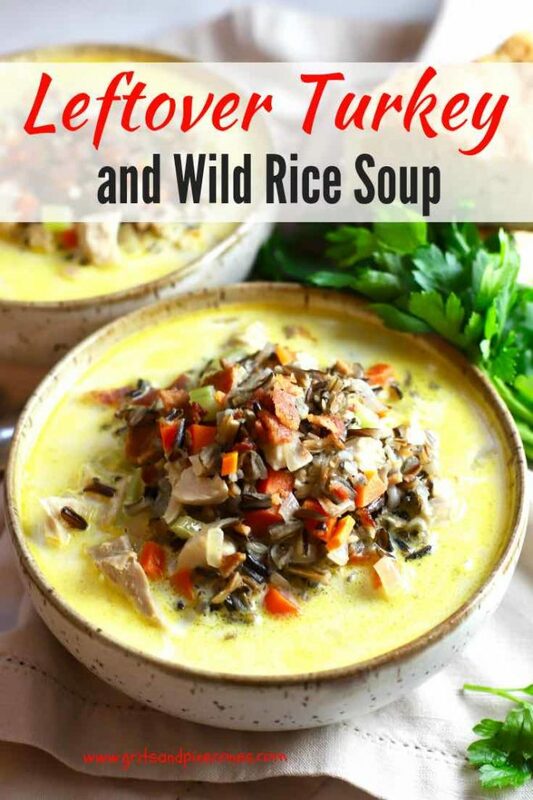 Pure comfort food, it’s thick, creamy, loaded with veggies, and the wild rice gives it a rich nutty flavor that you just can’t get with regular rice or even a wild rice blend. 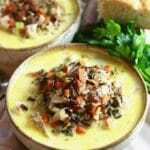 Turkey leftovers on Thanksgiving are one of those undeniable parts of life that you can always count on, and this Creamy Leftover Turkey and Wild Rice Soup is a perfect recipe to put all of that leftover turkey to good use! And, it’s the most delicious, hearty, thick-and-creamy, comforting soup you could ask for. Add 4 cups of water, butter and 1/2 tsp of salt to a large saucepan over medium-high heat and bring to a boil. Add rice and bring back to a boil. Reduce heat to low, cover and cook for 55 minutes or until the rice is tender. Drain and set aside. 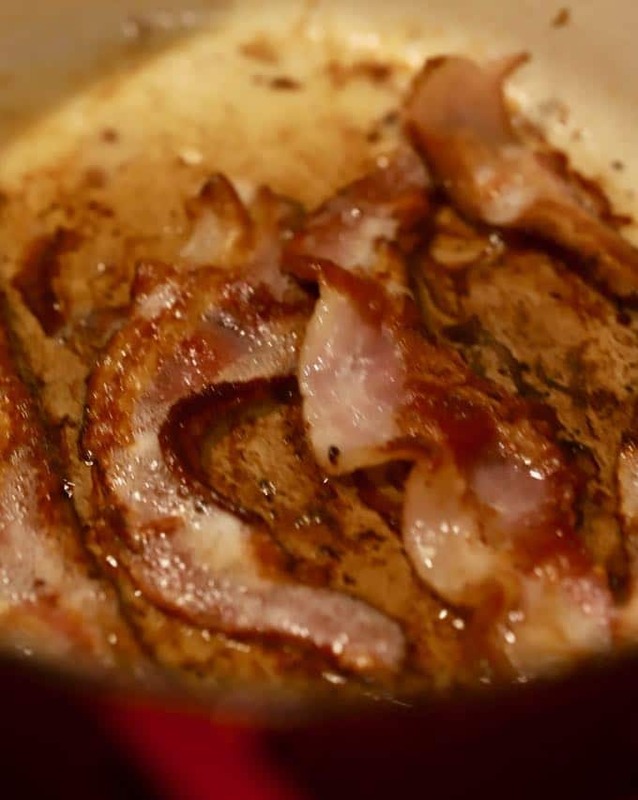 Cook bacon in a large Dutch oven or stockpot over medium heat for 7-8 minutes or until crisp. Remove bacon and drain on a paper towel. Chop and set aside. 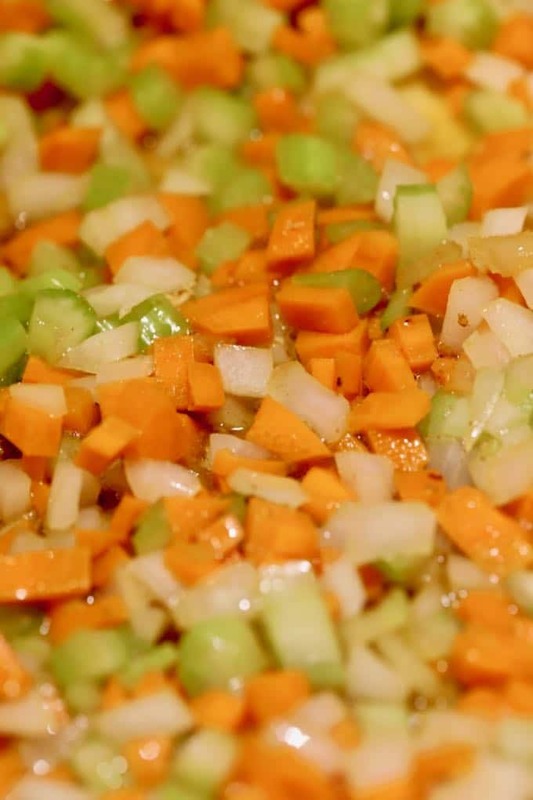 Reserve bacon drippings in the Dutch oven and add onion, carrots, and celery. Sauté for 4-5 minutes, or until tender. Add garlic, sauté for 1 minute, or until fragrant. Add 1/2 tsp salt, pepper, chicken broth, and turkey. Bring to a boil, cover, reduce heat to low and simmer for 5 minutes or until thoroughly heated. Add rice, bacon, and cream. 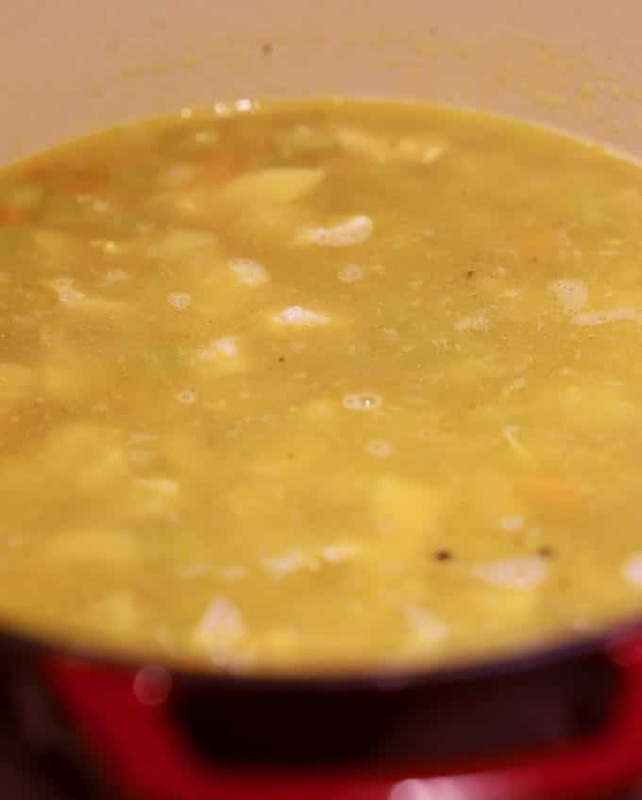 Increase heat to medium and cook 15 minutes or until the soup has slightly thickened. Remove from the heat, add parsley and serve. You can substitute chicken for turkey. This soup freezes well. Simply put in an airtight freezer container and freeze. Before heating, thaw overnight in the refrigerator. This recipe calls for wild rice, not a wild rice blend. 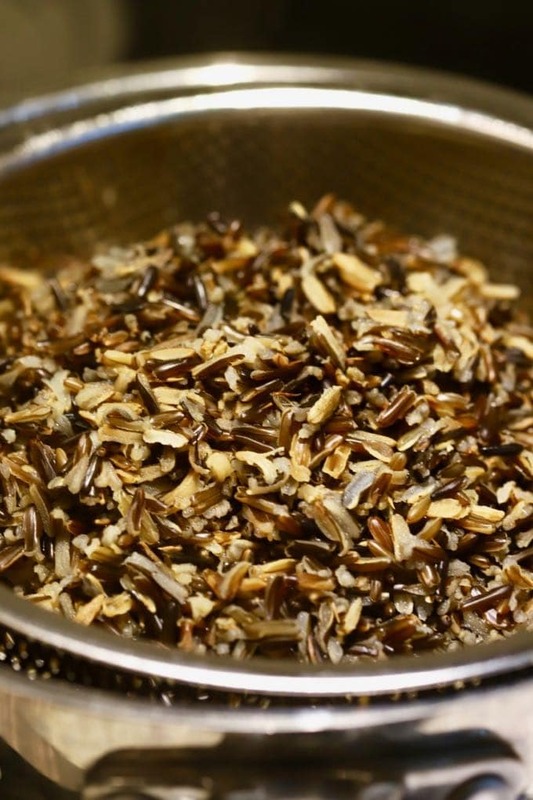 Despite the name, wild rice is actually not rice but is considered a grain. Leftover cooked turkey will keep for 3-4 days, or 2-3 months in the freezer if stored in an airtight container. 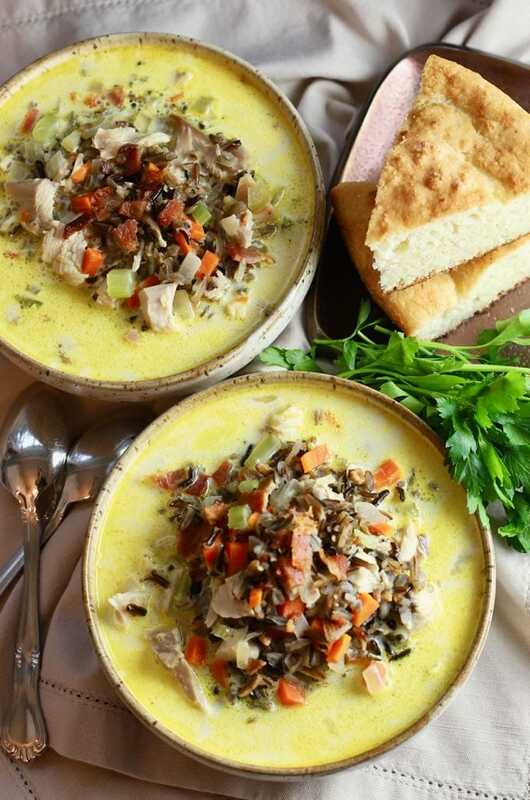 Turkey leftovers on Thanksgiving are one of those undeniable parts of life that you can always count on, and this Creamy Leftover Turkey and Wild Rice Soup is a perfect recipe to put all of that leftover turkey to good use! And, it's the most delicious, hearty, thick-and-creamy, comforting soup you could ask for.